I received my B.Eng. and M.Eng. degrees in electrical engineering from the École de technologie supérieure (ÉTS), Montréal, Canada, in 2006 and 2009, respectively, and the Ph.D. degree from McGill University, Montréal, Canada. From 2009 to 2010, I worked as a research professional in the NSERC - Ultra Electronics Chair in Wireless Emergency and Tactical Communications at ÉTS. From 2007 to 2016, I was a Lecturer in the Department of Electrical Engineering, ÉTS. I also collaborated as a research professional in the Research Chair in Design Methodology for Highly Integrated and Reliable Hybrid Systems (CRICSH) at ÉTS from 2012 to 2016. Then, from 2016 to 2018, I worked with Prof. Andreas Burg as a Postdoctoral Researcher at the Telecommunication Circuits Laboratory (TCL), Ecole polytechnique fédérale de Lausanne (EPFL), Switzerland. I am currently an Associate Professor in the Electrical Engineering Department of the École de technologie supérieure (ÉTS), Montréal, Canada. 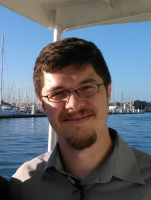 My research interests are in the design and implementation of signal processing systems with a focus on embedded systems, connected objects, and modern error-correcting codes. I received the Best Experimental-Demonstration Award at the IEEE CASS & ReSMiQ Innovation Day 2015. I serve as a reviewer for several IEEE journals and conferences. I am an Associate Editor for the Elsevier Microelectronics Journal. Mar 2019: Commented on pacemaker vulnerabilities to hacking for TVA Nouvelles in “Des défibrillateurs cardiaques vulnérables aux pirates informatiques”. Feb 2019: Made the VHDL implementation of our Lyra2 FPGA core for Lyra2REv2-based cryptocurrencies publically available. The corresponding paper, to appear at ISCAS 2019, can be found on here. Jan 2019: The LaCIME will hold its first Annual Congress (program and registration) on Feb. 21st 2019. Jan 2019: Paper on the hardware implementation of the Lyra2REv2 algorithm, used in various cryptocurrencies, has been accepted for publication at IEEE ISCAS 2019. Jan 2019: I’m cited in a La Presse newspaper article about airport Wi-Fi security. Dec 2018: I will be attending ISTC 2018 in Hong Kong. Sep 2018: Paper on belief-propagation-based blind-detection methods for polar codes as well as on the tradeoffs between accuracy and complexity in blind detection of polar codes accepted at ISTC 2018. Aug 2018: I started my new job as an associate professor at the electrical engineering department of École de technologie supérieure (ÉTS). Aug 2018: Our extention proposal about polar codes for FPGA in ORCA, a H2020 project funded by the EU, has won! Jun 2018: Invited talk at Université de Neuchâtel (UniNE), Arbeitsgemeinschaft in Codierungstheorie und Kryptographie (hosted by Dr Hugues Mercier). May 2018: I will be associate professor at the electrical engineering department of École de technologie supérieure (ÉTS) starting at the end of August! Apr 2018: NSERC Discovery grant approved! Apr 2018: Invited talk at École de technologie supérieure (ÉTS), Electrical engineering department. Apr 2018: I will be attending IEEE WCNC 2018 in Barcelona, Spain.